First prize winner of #NoShoSto 2017 Flash Fiction Slam. First prize winner of Writing on the Wall's WoWFest2016. First prize winner of Book Week Scotland 2014. 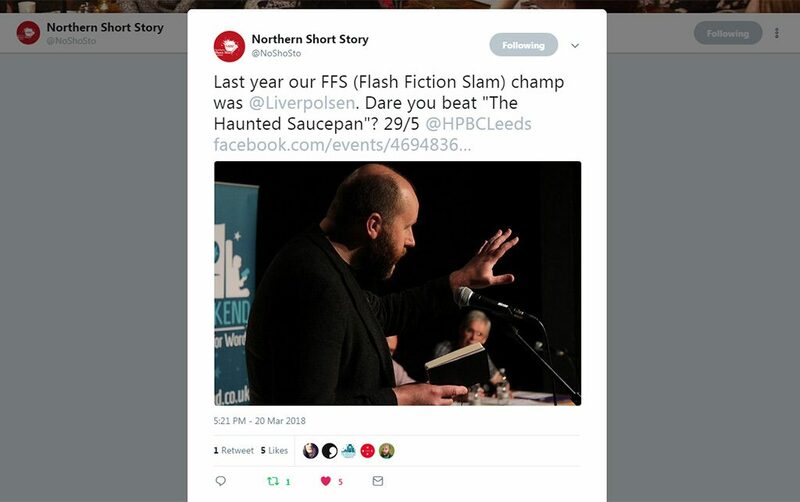 First prize winner of the Northern Short Story Festival 2017 Flash Fiction Slam. Phil performed his short story ‘The Haunted Pan’ at Leeds Big Bookend’s second annual #NoShoSto Festival. Compère and co-judge Jimmy Andrex (right) presented Phil with the #NoShoSto Festival Slam prize at Leeds Carriageworks in June 2017. 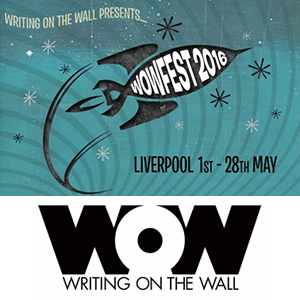 First prize winner of Writing on the Wall’s WoWFest2016 Flash Fiction competition. WoWFest2016 was sci-fi themed and Phil’s ‘Orrery’ was announced as the winning 500 word short story which answered the brief of ‘The Ninth Planet’. Radio producer Dirk Maggs (left) presented Phil with the WoWFest prize at Liverpool Central Library in May 2016. 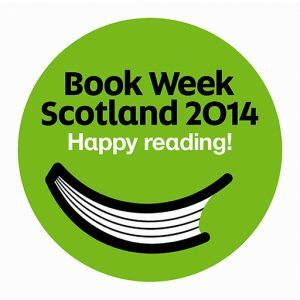 First prize winner of Book Week Scotland 2014 Flash Fiction competition. Finalist in NYC Midnight’s Short Story Challenge 2018. Written to strict genre, subject and character constraints, Phil’s comedy ‘Pull Together to Pull it Off’ was placed in the top 3 of its heat. Progressing to round two, Phil’s drama ‘Frontier Control’ also placed in the top 3 of its heat, securing him a place in the final. The NYC Midnight Short Story Challenge 2018 had 4000 entries for Round one. 625 writers (the top 5 in each heat) were put through to round two and given a new brief, a shorter word limit and a tighter deadline. 75 finalists (the top 3 in each heat) were then given a third brief and just 24 hours to submit their final story. Shortlisted for the Bath Flash Fiction Award in October 2017. Competition judge David Swann selected my flash fiction story ‘Single Use’ for the shortlist of twenty. The autumn 2017 round of the Bath Flash Fiction Award recieved 936 entries from 34 different countries. A longlist of 50 was announced before guest judge David Swann chose a shortlist of 20.